We have seven very comfortable guest bedrooms. Two rooms with queen size beds en-suite, 2 family rooms en-suite and two doubles and a single room which share a bathroom. All rooms are furnished to a high standard and have colour televisions with cable TV. 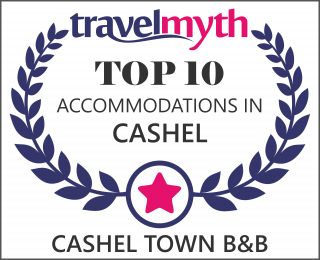 BREAKFAST: Cashel Bed & Breakfast is a member of the Tipperary Convivium of Slow Food. The breakfast menu is sourced from local producers and shops regularly at the Cahir Farmers Market and O’Dwyers Butchers Cashel. The Breakfast consists of apple juice, organic porridge, herbal teas, homemade brown bread, sausage, rasher and puddings , and local jams/preserves of the season. CONTINENTAL BREAKFAST: consists of organic porridge, herbal teas, homemade brown bread, local cheeses, yogurt and fruit of the season.